Two women grinding flour outside a hut. The women to the left is a married woman, indicated by her skirt. The hut itself has gaps between the upright poles, suggesting that it was used for cooking in during the rains, which is when Evans-Pritchard carried out fieldwork in 1935. The grinding slabs themselves are made of baked earth and are angled downwards so that the flour falls onto a mat. To the left is a raised storage pole, with what may be strips of meat hanging down out of reach of animals. Note on print reverse ms pencil - "64 2 A157" & print front border ms ink - "NUER X/62"
Morton, Chris. 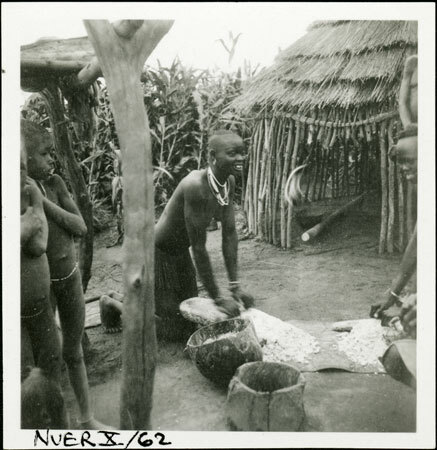 "Nuer flour grinding" Southern Sudan Project (in development). 03 Jan. 2006. Pitt Rivers Museum. <http://southernsudan.prm.ox.ac.uk/details/1998.355.479.2/>.